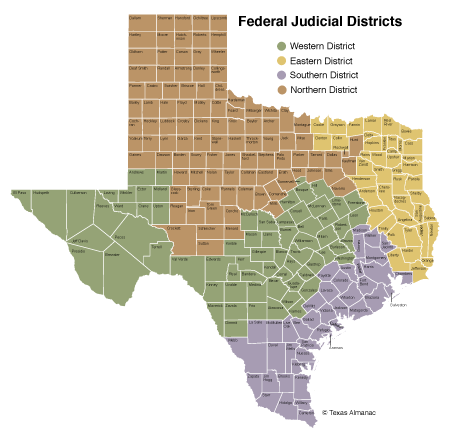 The Eastern District of Texas winds its way from the gulf coast along the Louisiana and Arkansas border and up to Oklahoma. The district does not include of the largest Texas cities, but it does include the Dallas suburb of Plano (we can debate whether it is a suburb, but it is). Plano is important because it is Corporate HQ for a number of large companies and also serves as regional HQ for many others. Plano is also supporting E.D.Tex. as an ongoing venue for patent infringement cases. In TC Heartland (2017) the Supreme Court ruled that a patent infringement lawsuit against a US company can only be filed in a venue (1) where the defendant is registered as a corporation (i.e., “a Delaware Corporation”); or (2) a venue where the defendant “has committed acts of infringement and has a regular and established place of business.” Quoting 28 U.S.C. 1400(b). Previously, the Federal Circuit had ruled that venue was proper in any court with personal jurisdiction over the defendant. The new narrower venue rules have shifted the field because many prior E.D.Tex. defendants are not Texas Corporations and do not satisfy the alternate “regular and established place of business” prong of the proper venue test. The resulting shift has been major. Prior to TC Heartland about half of patent infringement lawsuits were filed in E.D.Tex; Now the number has dropped to about 14%. I wanted to look at who is still getting sued in E.D.Tex. For this mini-study, I just looked at the original complaints of the 18 patent infringement lawsuits filed in E.D.Tex during the first three weeks of 2019. Of the 18, the vast majority (two-thirds) assert venue based upon the defendant having a regular and established place of business located in Plano. The remaining lawsuits can be broken into two different categories for venue: Three (17%) involve defendants that are residents of Texas and whose HQs are located in the District; and three more (17%) are foreign defendants who can are arguably not limited by the two-prong TC Heartland test, but rather can be sued in any jurisdiction for venue purposes. 28 U.S.C. 1391(c)(3). Ironworks Patents LLC v. AsusTek Computer Inc.
Rembrandt Wireless Technologies, LP v. Apple Inc.
ICON Health & Fitness, Inc. v. Flywheel Sports, Inc. Proximity Sensors of Texas, LLC v. AMS-TAOS USA, Inc.
Fireblok IP Holdings, LLC v. Hilti, Inc.
Flectere LLC v. United Parcel Service, Inc.
Akoloutheo, LLC v. Palo Alto Networks, Inc.
UnoWeb Virtual, LLC v. Open Text, Inc.
UnoWeb Virtual, LLC v. TBC-Monde, Inc. This is nothing new, Plano has been the anchor for E.D. Texas venue since T.C. Heartland was decided almost two years ago. It’s the most economically and technologically developed region in the Eastern District of Texas. Some companies (especially smaller ones) have relocated commercial and retail facilities out of Plano after being tagged with a patent suit in that district. They feel understandably outraged at having to spend a million or more dollars defending a patent suit in a plaintiff-friendly district, that would almost certainly never have been filed without the Plano presence. Many of these companies make the economically rational decision that being in Plano just isn’t worth it. Which companies? Plano, Frisco, and McKinney are experiencing tremendous commercial growth. >Who thinks that Congress should pass a law that permits me to file an infringement action here? >Who thinks Congress should require that I to go each state where each infringer is incorporated to enforce my rights? These really should be addressed. MM has disrupted the threat—again–because he doesn’t like the message. Have you ever seen anything — anything at all — that is Pro-patentee or yields a stronger patent right that Malcolm has liked? Nearly 14 full years and not one thing comes to mind. He is clearly a paid blogger. Then whoever is paying him should demand their money back. I have never seen a worse advocate for a cause. He sullies the views that he tries to represent, and often makes the case for the opposing view when all that he can do is v0m1t forth his stale ad hominem. Plano is where I live, work, and pay taxes. It where my company is headquartered, incorporated, and operates. It is where I conceived of my invention, built my first prototype, and assembled and shipped my first batch of production. It is also where substantial infringement occurred. The infringer is incorporated in New Jersey. Who thinks that Congress should pass a law that permits me to file an infringement action here? Who thinks Congress should require that I to go each state where each infringer is incorporated to enforce my rights? I think you should crawl back under the rock where you came from and fondle your water balloons. Shocking to learn that you live in Plano, by the way. Nobody could have predicted! Shocking that you display more of the same cognitive dissonance. Focus on figuring out how to pay for that wall, Billy. It’s very important to you! The brown hordes are coming and they are going to file patents with multiple inventors, totally messin’ with The Sovereign! A dark day for Merka. But thank goodness we don’t have to worry about Hillary’s email server. Both sides! That’s ‘Merica to you foreigner. Your “one-bucketing” continues in its mindless and aberrant manner. As does your strawman and attempt to portray my position in regards to Hillary to be one based on her email server. It must be nice for you to be so lazy to ascribe positions that I do not have in order to NOT put any effort into critical thinking as to why I have noted a “both sides” type of issue as a driving problem to today’s political climate. Maybe — just maybe — you should spend more than that minimal effort that you spend in reaching for your typical mindless ad hominem (over and over and over again), and instead formulate SOME intelligent (and inte11ectually honest) posts that actually engage with what others post. It would be a great way for you to start your 15th year here. If the bucket fits, Billy, wear it like the Proud Boy you are. That’s just it, Malcolm – the bucket does NOT fit. You are just too lazy to engage in an inte11ectually honest manner to see that. Lazy, and just not bright enough to compete in an intellectual engagement. Hence, you act just like Trump. Anon bruh, just give up for now, just accept the leftist’s characterization, vote trump (repudiation of the left vote) and move on. No need to defend yourself ad infinitum. You owe him no explanation, but a repudiation would do him good. Playing to his odd (and completely wrong) fantasied vis a vis one-bucketing will NOT repudiate him. Your path only provides him with more “I’m a vic tum” whining. A vulgar ad hominin attack by MM with no substance. And I have resided here since 1980. The big picture is that there are fewer and fewer companies left in the USA. There are just a few super corporations and that don’t want patents to be enforceable by the little person. Right now they are fine with keeping patents as long as they can only be enforced by the big corporations against little companies. Josh, I appreciate that view but note that the things you mention are not relevant to most patent suit discovery or legal issues. Do you think inventors in my situation should not be allowed to file in our home district when infringement occurs here? That post had a remarkably few – albeit exceptionally cogent – comments. Hey, Lindsey, maybe the two you can blow your brains out together! Go up on a tall hill and make a big show out of it. You guys will be glad to know that even if they don’t get the PTO worked out in the new shutdown deal reached today the office will apparently have funds to run till mid-February. This is a lot longer than the post on PO had indicated a few weeks back. Barry Schwab is the dirtbag patent attorney behind the school district lawsuits (this isn’t the first one). How much would it cost for productive companies to abandon or exclude the Eastern District of Texas? Maybe there are legal reasons those sorts of things wouldn’t work. Or maybe there are practical reasons why these ideas aren’t very good. I sometimes wonder. Maybe there are legal reasons those sorts of things wouldn’t work. I’d love to hear from the gilbert@rian patent maximalists about that. But even more I’d love to see them post videos of themselves crushing their iPhones so they can “own” the “anti-p@tent” “communists”. Because the post you are responding to said something (anything) about solo inventors…. Supposedly you are an attorney and recognize a lawful action. Supposedly you are a patent attorney and recognize that patent law does not cut any slack for infringement because the Infringer is a school district. Wow. You simply have zero control over your emotions, eh? Much like a certain other person. Last time I checked the mere fact that an action was “legal” didn’t shield that action from criticism. Grow up, snowflake. Just because you’re an ethically bankrupt t 0 0l doesn’t mean that the rest of us have to be. You quite miss the thrust that your criticisms should do more than merely rely on your feelings. But hey, that falls directly in line with your number one meme of Accuse Others, oh Trump of these boards. How very Trump of you. I know. MM is so much like Trump. Your comments about how MM accuses others of what he does is exactly correct. I’ve done some litigation and that is exactly what the slim ey litigators do. This blog is nothing compared to what I get accused of as a litigator. There’s a troll sueing the school district?? Wow indeed – is there a law allowing infringement by school districts? The 11th Amendment. I don’t know Texas law specifically whether they treat school districts as state or private entities, but school boards are generally state institutions. Are there any court decisions awarding costs to a state entity in a patent infringement suit when there is no basis for waiver by the state? Thanks Greenacre – that was a cogent reply. So, one would have to settle for injunctions then, eh? Especially since 28 U.S. Code § 1498 is for the Federal government only, rather than a State or local government.